Periodontal fiber is attached to the dentin of the root of the tooth by cementum and to the bone of the jaws by alveolar bone. 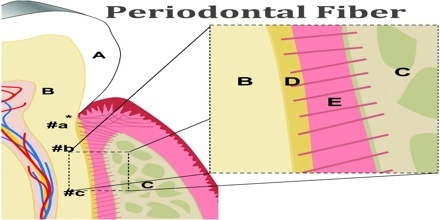 Periodontal fiber or periodontal ligament, commonly abbreviated as the PDL and it is a group of specialized connective tissue fibers. Periodontal Fiber also contains oxytalan fibers that are related to the microfibrillar component of elastic fibers. They generally run parallel to the root surface, although they can occasionally insert into cementum. Periodontal fiber or ligament is composed of collagen fibers that originate as fibers of different diameters at the mineralized surfaces where the fibers are continuous with their mineralized portion. It consists of cells, and extracellular compartment of fibers. The cells are fibroblast, epithelial cells, undifferentiated mesenchymal cells, bone and cementum cells. 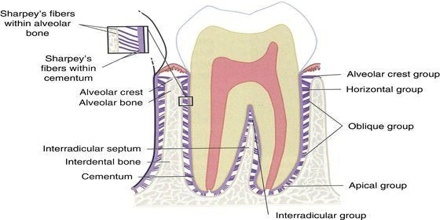 At the time of cementum formation the continuous layer of epithelium that covers the surface of newly formed dentin breaks into lacelike stands. These cells rests can be distinguished from fibroblasts in pdl by the close packing of their cuboidal cells and their nucleus stains more deeply. 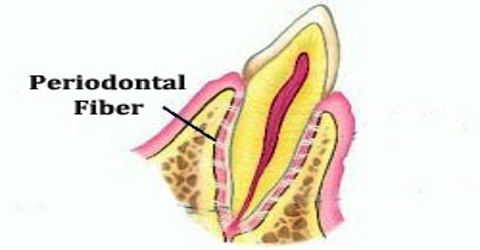 The periodontal ligament fibers (F) originate from relatively thin fibers (*) inserted into the cementum. After they unravel and become intermeshed with adjacent fibers, they form thicker fiber bundles that insert into bundle bone (BB), so named because it contains numerous Sharpey’s fibers (SF). Periodontal fiber or ligament serves a major remodeling function by providing cells that are able to form as well as resorb all the tissues that make up the attachment apparatus, i.e. bone, cementum and the periodontal ligament Undifferentiated ectomesenchymal cells, located around blood vessels, can differentiate into the specialized cells that form bone (osteoblasts), cementum (cementoblasts), and connective tissue fibers (fibroblasts). It provides a nutritive function that maintains the vitality of its various cells. The ligament is well-vascularized, with the major blood supply originating from the dental arteries that enter the ligament through the fundus of the alveoli. Its substance has been estimated to be 70% water, which is thought to have a significant effect on the tooth’s ability to withstand stress loads. The completeness and vitality of the PDL are essential for the functioning of the tooth. Its appears as the periodontal space of 0.4 to 1.5 mm on radiographs, a radiolucent area between the radiopaque lamina dura of the alveolar bone proper and the radiopaque cementum. Periodontal fiber or ligament also serves a sensory function. The myelinated dental nerves that perforate the fundus of the alveoli rapidly lose their myelinated sheath as they branch to supply both the pulp and periodontal ligament. The periodontal ligament is richly supplied with nerve endings that are primarily receptors for pain and pressure. Periodontal fiber or ligament also undergoes drastic changes with chronic periodontal disease that involves the deeper structures of the periodontium with periodontitis. The fibers of the PDL become disorganized, and their attachments to either the alveolar bone proper or cementum through Sharpey fibers are lost because of the resorption of these two hard dental tissue.